NutriStart Bamboo Silica is an essential element for maintaining the integrity and health of the skin, ligaments, tendons and bones. Bamboo extract is the richest known source of silica; it contains over 70% organic silica and is 10X more potent than horsetail silica. Silica has a restorative effect on many of the body's tissues. Suggested Usage: One capsule per day with or without food. Recommendations: The average daily requirement for silica is between 10mg and 20mg. A therapeutic dose can be 2 to 3 times that amount. 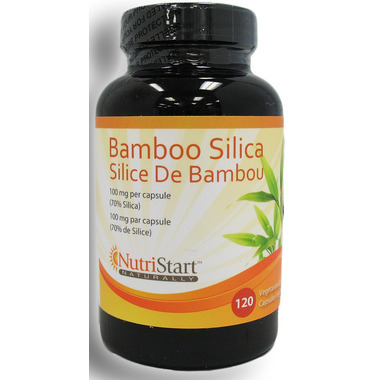 One capsule of NutriStart Bamboo Silica contains 70mg of silica. I have been using bamboo silica for years. When I was younger it helped to regulate pms problems, is great for skin/nails/hair as well. Seemed to help my lungs become less susceptible to colds as well. Not sure if it will have that effect on everyone though but it worked on me. Also great in combination with collagen supplements. A great alternative to expensive hair and skin treatments that simply work on the outside - this helps strengthen my hair and skin from the inside.